Mina had hula lessons tonight so I called Ogre as we were finishing up to figure out dinner. He had told me to find some place between here and there as I drove to where she has class, but I did not see much on my way there. We ended up deciding to meet off 75 (I take the back streets when I drive her there). 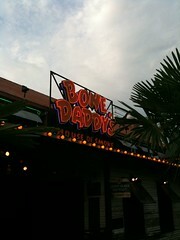 We decided on Bone Daddy’s since Mina did a great job at hula class and she LOVES ribs. Ogre and Benji showed up shortly thereafter and Mina then had to show Papa what she had learned. We ordered dinner and Benji also colored on his activity sheet while we waited. Our food showed up pretty shortly. Unfortunately, Benji must have not been hungry as he decided he’d spend his time traveling under the table from one bench to the other. Mina was too busy eating to really care what her brother was doing. Ogre’s eating was hold as he wanted some pickles and onions. We could not find our waitress anywhere! I even answered a work related call and walked outside to talk and came back with Ogre still trying to figure out which one was our waitress and where she was! Mina finished up her ribs and proudly announced that she was done. I asked her if she wanted more and she excitedly nodded her head saying yes so I gave her the meat off two more of my ribs! Benji did end up eating some of the cheese bread as the rest of us finished up dinner and headed home…well, the kids and Ogre headed home. I had to detour to the hospital for a quick admission! I ordered the half slab of ribs with corn (advertised as “sweet corn off the cob”) and skillet beans. The ribs were pretty meaty and they were somewhat tender, but not fall off the bone tender. The BBQ sauce was okay, being sweet with a little tiny bit of kick to it. Overall, average ribs. The corn was abyssmal, I could be wrong, but I think they are the kind that come out of a can and it has the bell pepper bits in it. I’m not a fan. The skillet beans were also just sort of average having a strong chili flavor to them, which I didn’t like. Ogre ordered a combo plate with beef brisket and sausage and cole slaw and potato salad. Ogre thought it was “really good.” The beef brisket was fatty enough according to the Ogre. He thought the cole slaw was also good with a nice amount of tang and mayo flavor. He also liked the potato salad (it’s mustard based). I tried his potato salad and thought it was average -it also has the bell pepper bits in it. Mina had ribs and mac and cheese. She loves ribs and after she polished off hers, she had some of mine! The mac and cheese is baked and pretty good, but not excellent. Average. Initially, she did well, but we lost her for awhile after we got our food; she was pretty non-existent after we got our food. Food comes out at good pace. If you’re a pre-adolescent or teenage boy (heck, even if you’re older), you’ll probably think this place is great! It does meet the kid friendly criteria of having a kids menu and kids activities to keep the kids busy, but they waitresses are pretty scantily clad. Ogre thinks more so than Hooter’s! The BBQ here is just average in my opinion. I’d come here again to eat, but it’s not my favorite BBQ place by any stretch of the imagination and it’s not because I care what the girls look like. That doesn’t bother me. I am sending iit to some buddies ans additionally sharing in delicious.